This coffee will be fresh roasted for you. We expect Equator Coffees & Teas will roast and ship this coffee in 1-2 business days depending on their roasting schedule. This is the Panther Blend brought to you by Equator Coffees & Teas. This is Equator's darkest roast. The Panther blend features high grown, extremely dense coffees from some of their favorite Latin American origins. They take these coffees to the smoky edge, developing rich flavors that highlight bittersweet chocolate. Dark, easy to drink coffee. Smell is very pleasing and tastes nice too. Wish it was bit bolder, otherwise this deserves a 5-star. Also it was clearly labeled when it was roasted which is really nice. Pretty good! Very important to get the perfect grinds to water ratio-- otherwise can be too weak or very bitter! Just an average coffee. There are no flavors that really come forward leaving a coffee that is just "meh". No real complaints about this coffee, I loved it! It definitely stays true to the claims of being bold. Visually a nice roast as well. Bit too burnt for my liking. I like dark coffee with complex, roasty delicious aromas. My problem with anything lighter than a dark roast is that they are often not as smooth and have too much acid. I like a dark, smooth, aromatic (roast aroma, not like "hints of gooseberry, leather and formaldehyde" pretentious hipster aroma) brew. Very good. Love it. Only my second "excellent" I think. This coffee has fuller flavor and is the best tasting of the four. It does irritate my reflux so I can have only half a cup. This is an accurate description except we're not a fan of anything bitter and tend not to like the ones that describe a smoky flavor. We need to use more milk and sweetener with this bean than others. Best coffee I've received thus far from Mistobox! Great bold flavor. Nice bold taste, not very smoky (good) some chocolate. Made very good expresso. Good flavor, not bitter. Made first few pots a bit weak since it's so dark. Nice with a bit of milk and sugar. I love this coffee! Much better than the first one. It was not acidic in the slightest (which I like) and was very rich and 'heavy' for lack of a better word. I looked forward to getting up and drinking this coffee. This was a good coffee despite having a sense of chocolate flavor to it. I enjoyed the boldness of this coffee. A delicious coffee. Bold in flavor with no bitter aftertaste. It's incredibly smooth! It grinds down quite finely. It has a quite smooth taste. This is the bold, dark coffee I'd typically buy, so it's no surprise that it's something I've found myself enjoying. Works really nicely as espresso and as brewed coffee alike. very nice, smooth and bold. The flavor was a bit light for me though, going to try a few cups with more beans. Nice, strong flavor. Does have a richness and smoothness to it. No acidity. Upped to 5 after finishing and finding I missed it. I hesitated to give this coffee 5 stars because I feel like there is always something better out there... That said, this is a super good coffee and really hits the profile I seem to like. Stands up to fresh cream perfectly and definitely has that rich flavor! Not a bad blend, but tended to have a little more bitterness in the brew. Nice flavor, moderately bold without any bitterness. I guess I prefer the darker roasts. Great taste and flavor. Had to use a larger amount of coffee to get the "strength" I look for in a good cup of coffee. Loved the darkness of this roast - wish there was more of a nut flavor. I am truly enjoying this coffee! It is rich, chocolatey and a little smokey. There is zero burnt flavor, it is smooth and I don't get any acidic bite that I tend to dislike. Great coffee made even better by a 3degree Winter day! I was a huge fan of this. Definitely in my comfort zone. Very smoky and a little nutty, especially when taken black. Adding cream brings out chocolate flavors and a subtle caramel/ brown sugar notes as well. one of my favorites. The chocolate flavoring is not too bitter or overwhelming. Powerful flavor yet surprisingly smooth! I liked this coffee a lot. Perfect mix of deep flavors, and rich taste. Not too dark. Really enjoyed! This coffee is dark and bold as advertised. I picked up subtle chocolate notes. It was a bit smokey. After my fourth brew, it grew on me. It's a decent cup of joe. I really enjoyed this coffee. The chocolate notes were very present and made for good cold brew. It was a little dark for my taste, but otherwise thoroughly enjoyable. Having trouble brewing this coffee to proper strength (it tastes somewhat mild/weak.) I like the chocolate flavors and the roast seems fairly fresh (although I'd prefer fresher.) Depth of flavor is good, and I'm sure it will be better if I can dial in the strength of the brew. I'd give it a B+ overall. I thought the coffee had too harsh of a bite to it, not full bodied to me, more something with a bite. Really great coffee, not strong in the caffeine department. Smells amazing. This one we did not like at all. Very watered down tasting no matter how we made it! Exactly what you expect. Fresh, dark, tasty. You have no idea what you've been drinking until you've drank flavor. WOW! So I ran out faster than I thought on my first bag and had to go back to my regular coffee...and what a difference. These are so much more flavorful and earthier than Gevalia. By the time the Equator came I couldn't wait to finish the Gevalia and start the Equator...and this one is just as bold, dark, beautiful and rich as the last one. (Though keep in mind I tend to add just 1 more extra scoop than I should...but that to me is how the flavor really comes out.) This one seems a little more earthy however I do have to admit, I kind of like the last one before a little better. I am curious about what one with a nutty flavor would be like....maybe in the next coming coffees. But this one is just as yummy. It was definitely better comparing to ones I've received before. However, it does give a bit of heartburn afterward. I wonder if it has to do with the darkest roast? So far out of five I've tried this one edges up to the top with Corsica Blend being second top in the group. I enjoyed this roast. It was nice and dark which is kind of my taste preference in general so that worked out great. When I read the description and it said it would be smoky I was a little nervous but it actually didn't come out that way to me. It was really smooth and I got some good dark chocolate from it but I definitely like something maybe more deep and aggressive and more aromatic. I'd drink this again though no doubt. I had my first cup today and I had to have my 2nd right away. Love the flavors so far. I'm becoming a big fan of the Equator coffees. Loved this roast. I have never had a full bean, always kcup, and this was a fantastic first experience. I enjoyed the rich flavor and the hours of energy! Awesome. This one was too acidic for me. It tasted beautiful but just a little too much acidity for me. This is the best coffee I ever had cold brewed. I really enjoy the subtle smokey flavor combined with a hint of bitter chocolate. Enjoyed this a whole bunch. I prefer dark coffees without having to go to an espresso roast, and this one is good and strong. There is a slightly chalky texture to it, which is okay, but why I gave it 4 and not 5 stars. Really liked this coffee! Perfect flavors, only drawback, found it a little "too" rich after the second cup. Full, dark, rich blend that was smooth and mellow aftertaste. Smooth, deep, dark roast that is one of my favorites! This has been my favorite coffee to date. Fantastic dark roast. Equator coffees are amazing. This blend didn't last long in our house. Really good coffee. Best yet. Very bold taste. Loved it. Very good, but don't expect it to be super dark. Dark and full of flavor, but just a bit too dark for my everyday cup. Very good nonetheless. Try is as a cold brew! best cup of coffee I've had in a while. i love the boldness in each sip. It took at least three cups over three separate mornings to finally distinguish the flavors in this coffee, and needless to say I was not disappointed. Dark, almost earthy notes, give way to the toasty richness of dark chocolate. I brewed all three cups with a Kaleta wave filter. A great dark roast, this is what I was expecting and looking forward to with my first order from mistobox. Loved it. Best coffee I've ever had from Misto. As a fan of dark roasts, this was an A . Love this coffee. Rich taste. Best coffee so far. Garbage. No depth of flavor that you would expect of a dark roast, which made it also the rare dark that was awful as iced coffee also. Panther has a blended flavor profile found in many other roasts but better. A medium roast at best. Beans are tan colored and almost dry. I really like Equator's blends! This one is quite bold - a big difference from their other dark roast but in my opinion far superior. Delicious, bold and earthy! To my taste, this is a great cup of coffee for everyday use. The best yet from Mistobox. I've tasted other Equator coffees, and they are consistently outstanding. 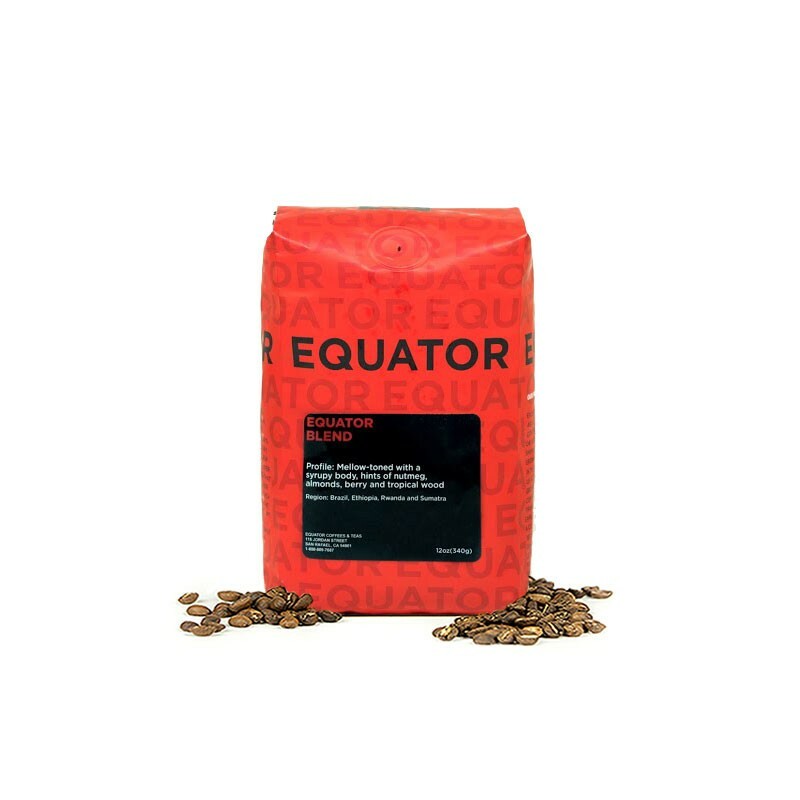 Now I can say that Equator is my new favorite roaster! After their French Roast, The Panther Blend gave me all I expect from a good shot of espresso! Rich, strong and full-bodied coffee. The crema has a very thick and syrupy texture. It has a complex flavor with several layers of tasting. This is my favorite roasted bean so far! Loved the smokiness, but not just burnt...complex in aroma and flavor. Notes of hazelnut and chocolate make the whole brewing experience enjoyable. Only tried this in aeropress, but very happy with the result! Quite good. It was a little too smoky or too earthy. But overall still delicious! I didn't think I would like a roast this dark, but it is delicious. I was a bit concerned about this coffee's description, as I am not a fan of "smoky" coffee. But, my worries were quieted after the first cup. A bold flavor with just a hint of the burnt taste and a good sense of bittersweet chocolate. It is really smooth and tasty. Even my wife, who typically puts lots of cream in her coffee, had a small cup of this served black, and she really enjoyed it. Good balance of flavor. This is more my style. Good job mistobox. What I liked: intense, dark, rich, no sourness, no burnt taste. No dislikes here. Rich smokey notes w/ flavors of bittersweet chocolate. Very enjoyable. Excellent dark roast for any time of day! Delicious hot or iced. Smooth, clean top taste, and if you're a sipper like me, you'll get to the chocolatey notes as the coffee sits. Brilliant. Best one we have received yet! This is my first time grinding beans at home so maybe i don't have it quite right yet, but this coffee has been coming out with a much lighter taste than my usually coffee. I like the flavors in it, but I like my coffee to be very dark and bold. This is a good dark roast. It's not bitter and it has a smooth finish. there is not an overwhelming flavor though, so in that way, for me, it leaves something to be desired. I really enjoyed the bold taste. The suttle smokiness was pleasing. I would purchase again. Too dark for our taste. It tasted like a cheap grocery store blend. Idea was good, but idea was better than the coffee. The notes on the package sound just like a coffee that I would love, but the coffee itself didn't live up to its billing. It's not bad, but neither as rich nor as complex as it was described. This was very responsive to my emails with Samantha, so I'm appreciative that you guys are trying. And my tastes are varied. I like some lighter, more floral coffees as well as some darker, richer ones. Both the coffees I've received so far are from roasters who are new to me, so that is fun discovery. Very unique flavor. Dark and roasty but still with a brighter bittersweet flavor that kept it from being a one-note coffee. Tried it as espresso and aeropress. More bitter in the espresso, darker, more sweet/chocolaty/toasty in the press. Smooth drinking and finish. On the right track, might like something a little bolder. Very good! Earthy, deep, a very nice dark roast! This was just horrible. Burnt-tasting and awful. This coffee is amazing! Rich tones, chocolate is amazing and the smokiness is great but not over powering. Well done! Pretty bold roast. I enjoy it on days I'm looking for that intensity. Good flavor, overall nice cup, strong but not bitter. My favorite of the coffees so far. Good flavor but too bold for my taste. pretty good but not great. Good flavors. nice to drink. I'd buy it again but it wouldn't be my first choice. However, if it was a little cheaper then my first choice I would consider it. delicious. dark but subtle enough to taste various notes. aroma is addictive. Liked the boldness without bitterness. Don't really have the vocabulary yet to explain more. This coffee is delicious. When it first finished brewing I thought the first couple sips were a tad strong for my taste. But after letting it sit for a minute I can get the more subtle flavors coming through and it's quite good. This is a spectacular robust full bodied drink. I LOVE this brew. Satisfying smoky with a chocolate kick as promised. My favorite so far. Rounds out breakfast - or makes a fabulous late day treat. Better than a candy bar. Another favorite. Terrific flavor. Also, grinds up probably the cleanest of any we've had so far. Outstanding... Deep, rich, sweet and chocolatey . . . exactly what I prefer in my morning cup! Enjoy the subtle flavors; very smooth. This one and the verve one are our favorite!! Love how smooth and balanced it is. Can you please send this one to our friend Perry who we gifted and the subscription to?? First coffee we received, loved it! This blend was my favorite in my most recent box. The beans are almost black in color and had a slight oily sheen. The smell was smoky with a hint of citrus. While I found this blend to be very balanced, I found it had a slightly sweet finish with a rich, smoky flavor. I would definitely purchase this blend again. I could actually taste the chocolate notes. This is a really good blend.